This is a pioneering project to involve people with disabilities in rugby. Mixed Ability Rugby Union teams have able-bodied players alongside team mates with learning and/or physical disabilities. 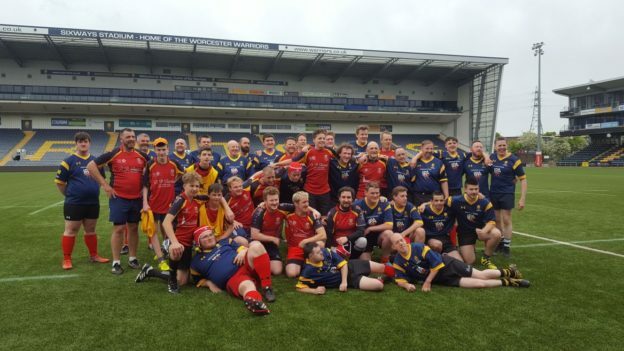 The Surrey Chargers, formed in 2016 are the Mixed Ability section of Chobham Rugby Football Club; a vibrant community club run by volunteers, and want to offer disabled people in Surrey from the age of 13 the opportunity to play Rugby. We train during the Rugby season ( September to April ) on Saturday mornings from 10 : 30 am – 12 : 00 pm and run informal touch rugby sessions on Thursday evenings during the Summer from 7 : 30 pm- 8 : 30 pm ( May to August ). Since starting up we have enjoyed a number of very successful trips to play matches at Bath, Worcester and the Premiership Rugby final at Twickenham and are looking to build on these during 2018 and beyond.